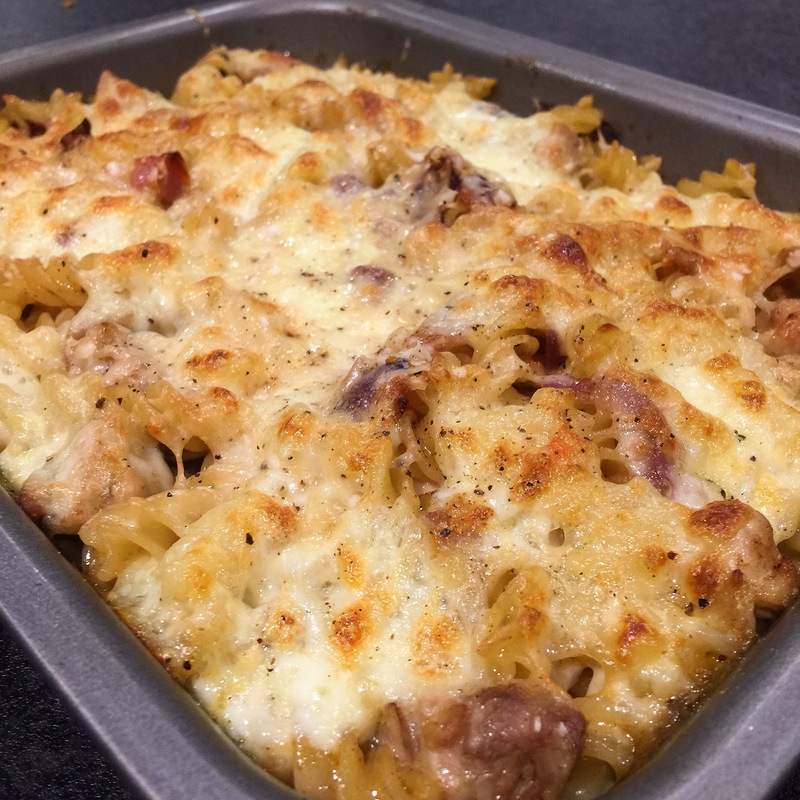 Baked Pasta? Mac & Cheese? Many, if not all, recipes for Mac & Cheese include starting off with a roux which is essentially flour and butter and it is aimed at cooking off the flour to make a paste after which milk is added, followed by cheese of your choice (forgive me if I’m wrong, as this is typed on whatever I can remember). So this is my way of making Mac & Cheese, without having bechamel sauce or starting off with a roux. It is a flexible recipe as you can adjust different components (or even add!) to suit your liking. I started off by frying some onions with chillis and garlic over a medium heat, until the onions are almost transparent. There are a variety of powders I added at this point: cumin, cayenne pepper, chilli and smoked paprika. At the same time, cook the pasta of your choice in salted boiling water. Next I added diced chicken thighs along with a little salt and pepper after about 2-3 minutes (or until the chicken is cooked). The aim of seasoning here is to build it up in layers so as to avoid dumping sizable amount of salt or pepper to ruin the whole dish. Your pasta should be almost cooked at this point and it is where you take out about a cup of pasta water and leave it on the side. Drain the pasta, add it to the chicken and fry it for 2-3 minutes until the pasta is al dente. Add the pasta water (it will dilute the pasta and chicken so season accordingly) and cook it for a while till you see a mild reduction in the sauce. Pour it into a small tray like the one I used or you could use a bigger tray if you have more pasta. This is where the fun part starts. Slice up two mozzarella balls and layer it on top of the pasta and grate some Parmesan cheese over it. And finally, bake it at about 200 degrees for about 10-15 minutes or until the surface turns golden-brown. Like I mentioned earlier, this recipe can be altered to your liking! If you like pancetta or chorizo, add it at the start to release the oils. I used fusilli here but you can use any other kinds of pasta. Change the cheese if you like to a stronger or a milder one! Have fun! This entry was posted in Things. and tagged cheese, cooking, food, pasta. Bookmark the permalink.